Japan has just experienced the nuclear accident from their troubled Fukushima Daiichi and Fukushima Daini nuclear power plants that the world has ever seen and it's not over yet. Why is that important? Well, one of the substances that can be released in a nuclear accident is radioactive iodine (I-131). And the levels have been increasing daily. You need a little bit of iodine so the thyroid gland in your neck can make hormones to regulate your metabolism. But your body can't tell the difference between the normal iodine found in salt or seafood and the radioactive variety from a wayward nuclear power station. So the thyroid, which concentrates iodine, can get a hefty dose of radiation from I-131 that makes it into the food supply after a nuclear incident. The radiation can hike the risk for subsequent thyroid cancer. Iodine is the building block for thyroid hormone. The thyroid gland has a very specific and strong affinity for absorbing iodine. Potassium tablets can saturate the gland and crowd out the radioactive iodine in a chemical competition, in that way, the radioactive iodine doesn't have as high a chance of damaging the gland. Iodine tablets can prevent the absorption of radioactive iodine for up to 24 hours, according to the Centers for Disease Control and Prevention. The amount of iodine you can get from iodized salt or your regular diet isn't enough to protect you. Young children and fetuses are most vulnerable to radioactive iodine, the CDC says. Older people aren't at as much risk, and CDC says people older than 40 shouldn't take preventive iodine supplements "unless a very large dose of radioactive iodine is expected" and public health officials recommend it. But even relatively modest doses of radiation can increase the risk that a person will develop thyroid cancer at some point in life. There's a delay between exposure and cancer that can run 10 to 20 years. The supplemental iodine isn't a complete guarantee of protection. A lag in taking the pills after exposure can reduce the supplement's effectiveness, for instance. 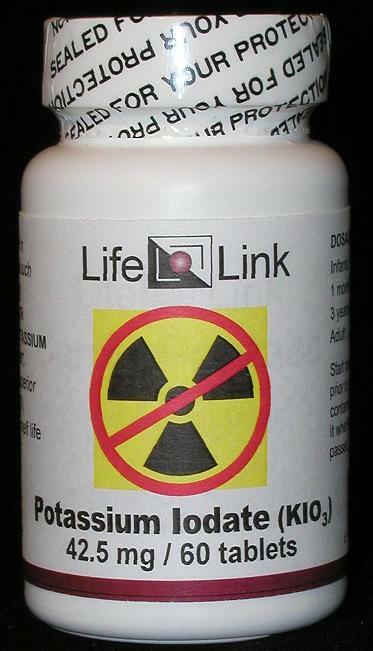 Also, the iodine pills only offer work against radioactive iodine — not other radioactive elements, such as cesium. And some people allergic to iodine or with certain skin conditions may not be able to tolerate the supplements. The Bush administration's controversial decision in 2008 to scrap plans to distribute anti radiation pills to people in a zone extending between 10 and 20 miles from the site of a nuclear incident. A White Memo says there are more effective responses, including evacuation, for people that far out.